A database of prospective and current clients who are in general, double-income households and people who are young-at-heart, open-minded and curious. email software has recently restricted emails even more. We designed an email, that by it's very nature communicated the concept of a spontaneous exploration. In order to read it you have to scroll left, right and down, revealing the message. If you go off the intended path there are messages to bring your attention back to the road. The mailer begins with a bold line of copy, "Are you feeling spontaneous?" This tempts our already inquisitive users to scroll down the page, following the vertical lines of copy and yellow road line. 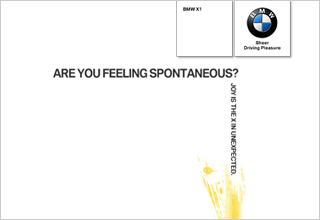 Using BMW language inside the mail such as "Joy awaits around the next corner," the emails content drives the viewer to keep exploring and find the end reveal. The last line of copy reveals the breathtaking new BMW X1 and a click through to the main BMW site where the information about the vehicle is housed.